This is another sweater I've knit several times, with different color combinations. It's actually hard to find yarn in appropriate horse colors - maybe for me, as I know so little about horses. This is an smaller adaptation of a larger sweater knitted for a wonderful lady's daughter. This is such a simple pattern, with commonly repeating elements: there are the apple trees in different states of bloom; there are roses. A simple trim of golden horseshoes on blue circles the wrists and hem, above the roses trim. The neck, wrists, and hem trim is alternating red and variegated blue stripes. This was for the seasonal sweater book I was working on. Here children in different colors skate upon a meandering frozen river, past birch trees and snow on the banks. The sky behind the mountains blooms with the northern lights - okay, if I saw that, I'd stop skating and just watch with amazement. On the sleeves one child stands still on the ice. The shoulders and neck have white swirls on dark blue. The wrists and hem trim has white figure eights on shades of blue. There is also a variation on a rib pattern at the hem, in red. 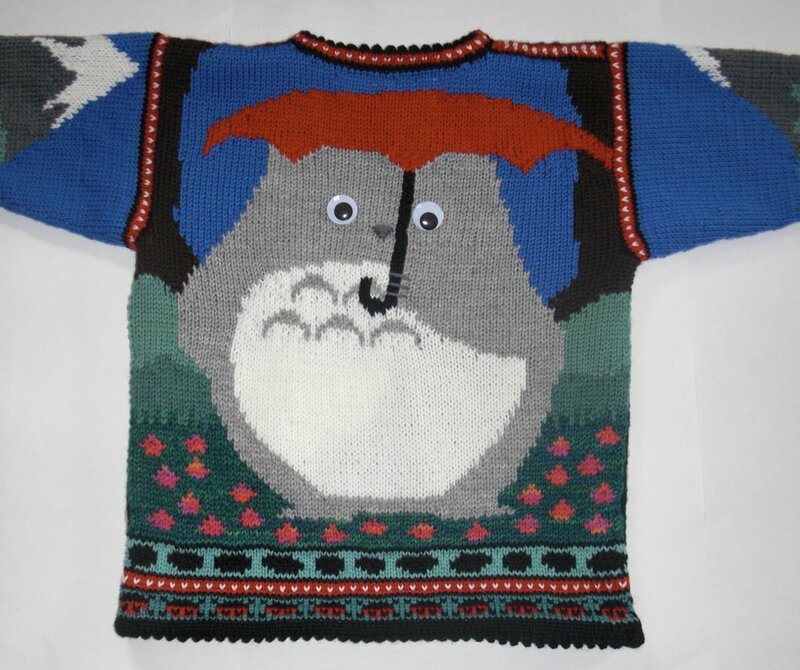 Again, another sweater meant to celebrate the seasons. At our school, May Day is celebrated with a lovely maypole dance. Here it is, depicted in a much simpler form! Ribbons are sewn on after knitting: on the front they are still working their way around the maypole, and on the back the ribbons are fully entwined. The sleeves are very simple, with a single flowering tree and either a peeking sun or a cloud-obscured sun. The neck, wrists, and hem have a shepherd's-crook pattern in greens on red. The wrists and hem have a purple and green pattern, and the neck, wrists, and hem are finished with a picot trim in purple. This was knitted before the traditional Mermaid Three Years sweater. The mermaid here follows the Waldorf idea of having no facial features, although for someone else that would be easy to add. On the front the mermaid shows off jewelry she found at the bottom of the sea, as she swims past corals and orange fish. On the back she swims to the surface, past more colorful fish and coral. The peplum shades from turquoise to green and ends with a picot trim. The neck and armhole openings carry on the blue from the sea and end in a turquoise picot trim. The jewelry is glass beads sewn on. 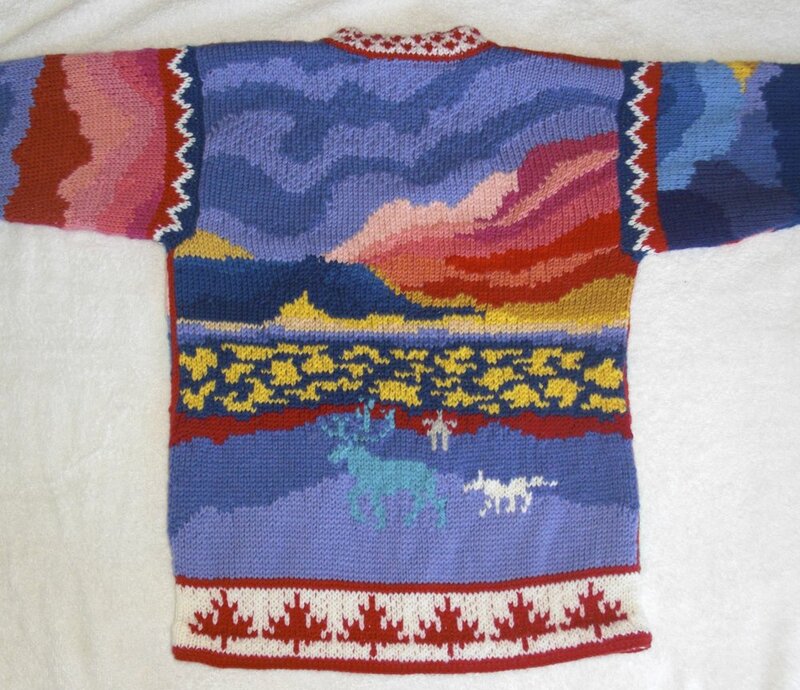 This is a version of Levin's Northern Lights sweater, with different colors. On the front are two polar bears under the red and turquoise northern lights. On the back are two penguins on ice under the Aurora Australis in shades of turquoise. The sleeves have the lights in reds and turquoises. The wrists and hem trim is white stars on shades of blue. The neck and wrists trim is rainbow rows. The hem trim is alternating ribbing stripes of variegated blue and black. I first made this sweater for Amaran. This was inspired by Ted Harrison's beautiful book O Canada. He painted scenes for each province. It is such a treasure! On the front is the scene for Quebec, with old houses and a peachy swirly sky. 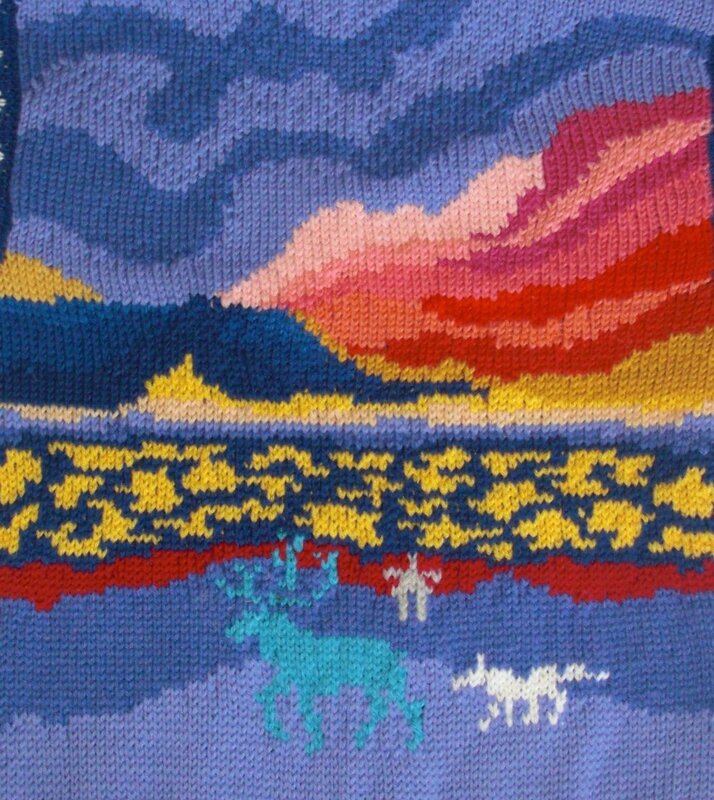 The back is the scene for the Northwest Territories, with an elk and a wolf in a bare landscape of amazing colors. 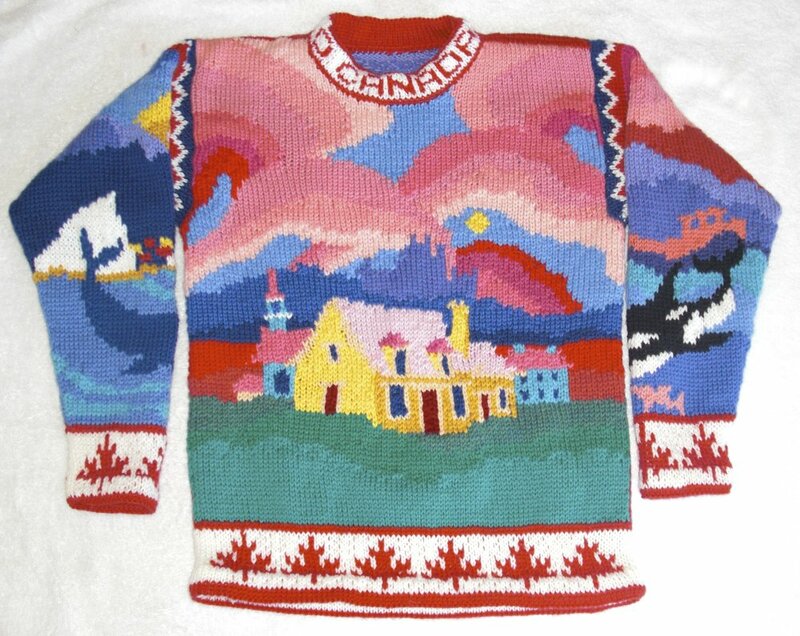 The left sleeve is British Columbia, with an Orca swimming in a deep blue sea, and the right sleeve is Newfoundland and Labrador, with a blue whale and more swirling colorful skies. Maple leaves in red on white are at the wrists and hems. The neck trim spells O Canada on the front and has little red crosses on the back. I am not Canadian, but my family loves their anthem and Ted Harrison's transcendent book. Saint Martin is another festival celebrated at our school by the first, second, and third graders. One amazingly pleasant aspect of all of our children going to the same school was that we had certain milestones to look forward to. Once Jirina and Amaran went through the Saint Martin festivals, we knew what Levin could expect. It was probably richest for him, to see what happened with the girls and then years later have his own experiences. The songs and community experience remain a fond memory for me. So here on the front is Saint Martin on his horse in the snow. On the back he is handing half of his cloak to the beggar. On the sleeves angels stand with glowing candles. Throughout all of the scenes are mountains and stars. On the wrists and hem is a trim pattern of gold crosses on a blue background. The neck, wrists, and hem trim is yellow to red and dark blue alternating stripes. This sweater was knit for a lovely lady who had twin boys. One sweater was knit with the orange tractor and truck and the other was knit with green. The cows also reversed their colors: one picture is the opposite cow from the green tractor sweater. I was sent a notice from John Deere that I was not allowed to have green tractors in my sweater, as they own the green tractor trademark. So I can't show you that version! On the front a tractor is lifting a hay bale. On the back the square hay bales are loaded onto a truck. On the mirrored sleeves a cow stands under an apple tree. How many times do I put these apple trees in sweaters! You'd think I eat apples constantly. The trim pattern is various farm tools against a blue background. The neck, wrists, and hem trim is variegated blue and red stripes or variegated red and blue stripes. 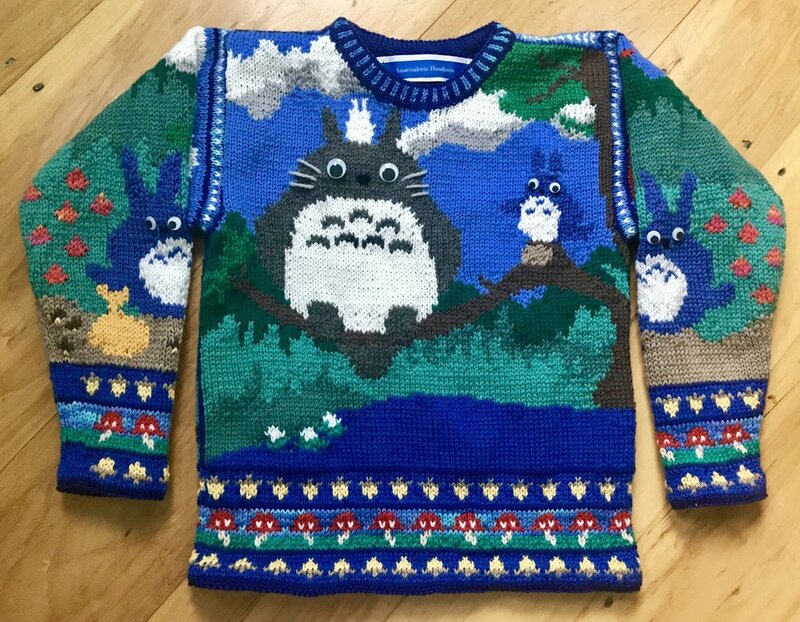 This is my second Totoro inspired sweater. We just saw My Neighbor Totoro in the theatre with two of our granddaughters and I loved it more this time! On the front the three Totoros are sitting on a tree branch over a pond, with greenery and sky and clouds behind them. On the back the Totoros are stretching to make the seeds grow into trees, under a moonlit sky. 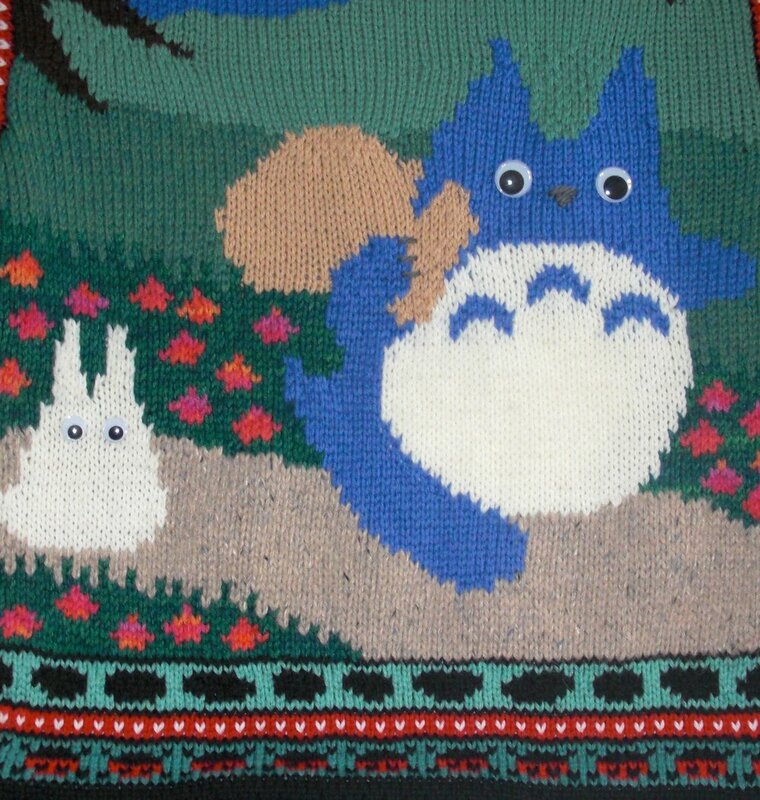 The mirrored sleeves show the blue and white Totoros gathering acorns into a bag and gathering blueberries from a bush. 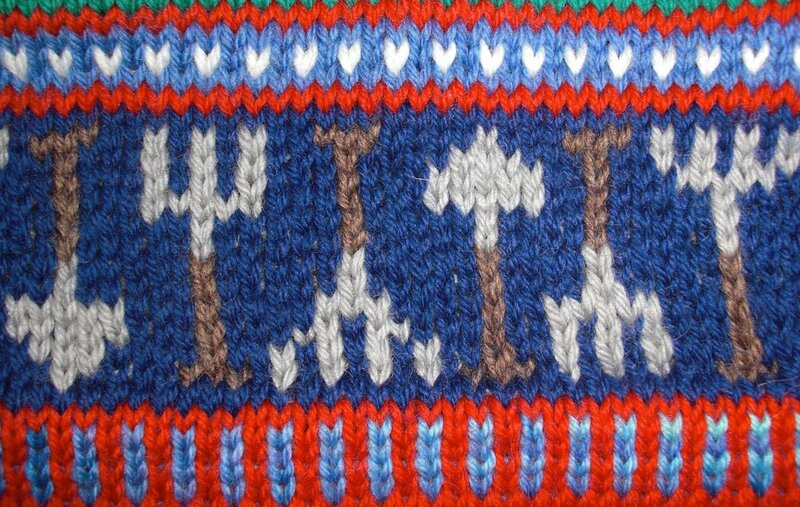 The wrists and hem have trim patterns of acorns on a blue background and red mushrooms against a lighter blue sky. The neck trim is dark blue and variegated blue stripes.